for "The New York Times"
Read the full NEW YORK TIMES ARTICLE and see additional images. 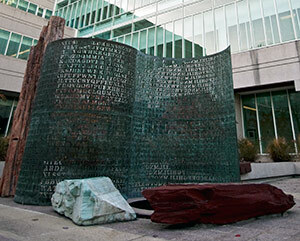 The artist who created the enigmatic Kryptos, a puzzle-in-a-sculpture that has driven code breakers to distraction since it was installed 24 years ago in a courtyard at C.I.A. headquarters in Langley, Va., has decided that it is time for a new clue. By 1999, nine years after it went up, Kryptos fans had deciphered three of the sculpture’s four messages — 865 letters punched through elegantly curved copper sheets that make up the most striking part of the work. (In fact, cryptographers at the National Security Agency cracked those messages in 1993, but kept the triumph to themselves.) The fourth and final passage, a mere 97 characters long, has thwarted thousands of followers ever since. Jim Sanborn, the sculptor, having grown impatient with the progress of the fans and their incessant prodding for clues — and the misguided insistence by some that they had actually solved the puzzle — provided a six-letter clue to the puzzle in 2010. The 64th through 69th characters of the final panel, when deciphered, spelled out the word BERLIN. Since then, the fans, many of whom keep up a lively online conversation, have come up empty-handed. And so Mr. Sanborn has decided to open the door a bit more with five additional letters, those in the 70th through 74th position. As it happens, there is a famous public timepiece known as the “Berlin clock,” a puzzle in itself that tells time through application of set theory. Its 24 lights count off the hours and minutes in rows and boxes, with hours in the top two rows and minutes in the two below. Divulging the clue “Berlin,” he said, led to “a tsunami” of entries that went off in every direction, including many “frivolous or debasing or hostile entries,” as well as messages from Nazi enthusiasts. The crush of people claiming to have solved the final puzzle, reached through a website Mr. Sanborn set up in 2010, had grown to be such a distraction that he set up a barrier to entry. 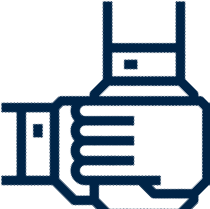 Two years ago, he instituted a $50 fee (via Western Union) for anyone wanting to test a possible solution; the fee guaranteed “an exchange of no more than two back-and-forth-emails,” and no additional clues. If Mr. Sanborn did not wish to respond to the entry, he said, he would return the money. He was designing the project, he further explained, when the Berlin Wall fell, and “there’s no doubt I was influenced by all that going on simultaneously.” With the 25th anniversary of the fall of the wall, he said, he thought it was worth returning to the topic. The news will undoubtedly scramble the thousands of people around the world who have tried to decrypt Mr. Sanborn’s brainchild, especially the members of a Yahoo group devoted to the sculpture. They meet every now and then in the real world with a dinner in the Washington area; Mr. Sanborn has attended, as have N.S.A. employees. That community keeps up a steady stream of chatter about possible solutions, and is roughly divided between those who are called the “O.S.C.s,” for Old School Cryptographers, and “Brownies,” for devotees of the thriller author Dan Brown, who has mentioned Kryptos in his work. Edward M. Scheidt, a retired chairman of the Central Intelligence Agency’s cryptographic center, worked with Mr. Sanborn to devise the cryptographic schemes he incorporated into the artwork. Mr. Scheidt, reached in Herndon, Va., at the encryption company TecSec, which he co-founded, said he would not have expected to find people still banging their heads against Kryptos so many years later. The creator of Kryptos, a sculpture that contains an 865-character encrypted message, has released a second clue for the final unsolved section. 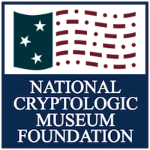 Click the link below to visit the full Cryptologic Bytes archives page.